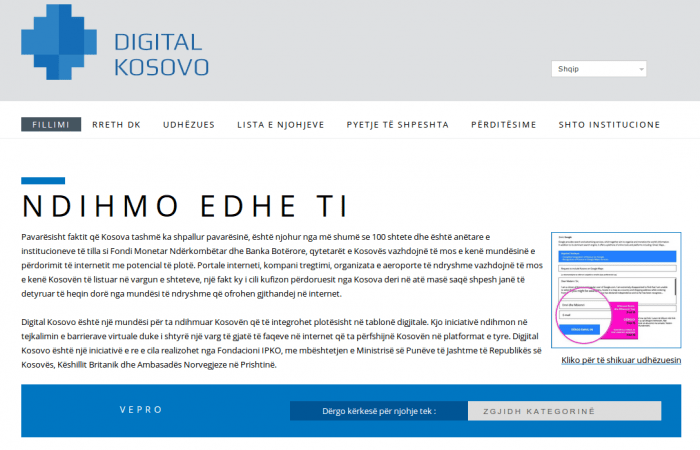 We launched Digital Kosovo project with the sole aim of supporting Kosovo’s integration into the Digital World. Since September 2, 2013 the team behind DK has succeeded to mobilize a large community who till now is engaged in hundreds digital diplomacy actions by sending requests to different institutions. This project has thrived to integrate Kosovo in websites of many airports, top internet properties, universities and other institutions. From the beginning Digital Kosovo was structured and designed to serve to the community and as such it is developed based on users suggestions, thoughts, and remarks. One of oftenly received suggestions was to build the Albanian version of the platform. It was a matter of time and now it is online hoping that this version will serve the best of the common mission. IF Team that stays behind the Digital Kosovo has worked to built the Albanian version of this platform with the desire to enable each Kosovo citizen become a Digital Diplomat. All instructions and other news in how to use this platform are now in Albanian version. To see the latest from this project, please visit www.digitalkosovo.org.